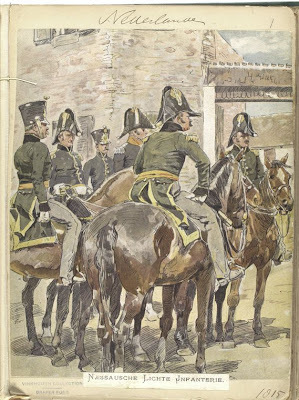 One of the integral battalions in the defense of Hougoumont was the 1/2 Nassau Light Infantry battalion. I was looking forward to painting this unit for several reasons. First it is always nice to paint a new army and this was the first unit in the Army of the Netherlands that I have got to paint. The other great thing about the Nassau was that they were a part of the Confederation of the Rhine earlier in the Napoleonic wars, so they can serve on either side depending on the year. Very useful indeed. I also really liked painting the Perry Hanoverian metals, they are beautifully proportioned figures and lend themselves to my technique. I went back and forth between the Front Rank and Perry, and eventually decided to go with Perry and believe I made the right choice. The only really downside was the amount of flash (which is just incredible), you chip it off before priming, and find that there is still multiple pieces to remove. It really was an endless job. Front Rank really are much better in this sense, but I do like the less robust figure. 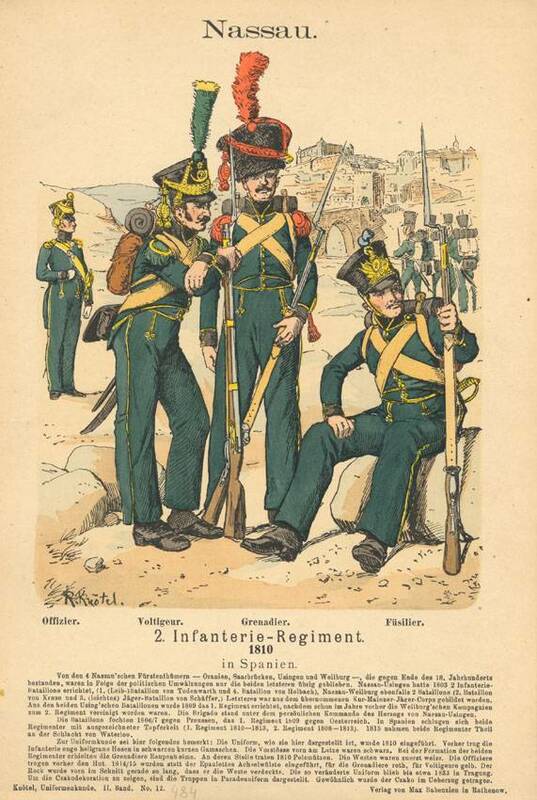 Here is a nice print from Knötel, which well illustrates both the centre and flank company figures. I found the green a little unbelievable though (I find it hard to believe that 19th century dyes gave bright colours or were very colourfast), so I kept on looking. I found this image in the NYPL digital gallery and it just seems more real to me, so I just to emulate this shade. The 1/2nd Nassau was in the Netherlands order of battle in the 2nd Netherlands Infantry Division, 2nd Brigade under Prince Bernard of Saxe-Weimar. The Nassau battalions were all quite large and the 1/2nd had 889 men all told. This makes it a large Lasalle unit, requiring 6 bases. The Nassau battalions had 6 companies, 4 centre and 2 flank. The centre companies were distinguished by their shako pompon colour: Yellow, white, blue, black, numbered 1 through 4. An excellent resource is the St Jean Cent Jours website for all things Waterloo. I decided to go with the usual white primer, followed by a thin wash of GW Catachan Green, then a drybrush (yes I do occasionally drybrush) of GW Camo Green. I did not want to go too yellow with the leather so used Vallejo Sand Yellow and used Vallejo Flat Yellow as the facing colour. A Maverick Flag linen was used for the colours, but this was heavily retouched with a bright yellow wash. I apologize for the quality of the photos, I did not use accessory lighting, so I really had to rely on photoshop to lighten up the images. 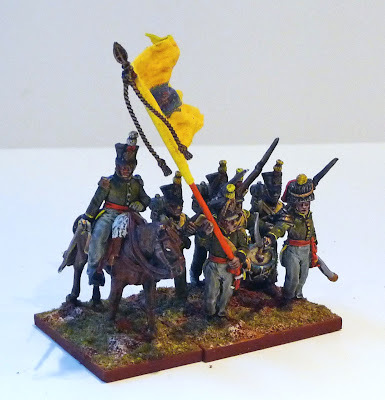 Here is the command stand, I decided use a busby on Captain Büsgen, the mounted figure represents Colonel F.W. van Goedececke, chef de corps. Well just one more battalion to paint and I am ready to run the Hougoumont scenario!! You have a really interesting painting technique and it looks brilliant, I've never been able to do washes well. I love the Nassauers in their green and orange, especially the grenadiers in their colpacks. 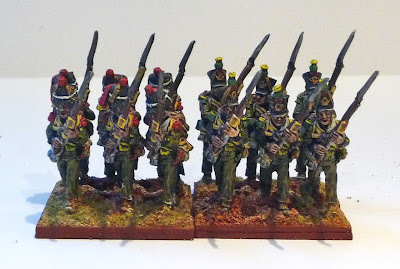 I've got some HaT Nassauers still unpainted, which I plan to use on the French side in the Peninsula. Yours are lovely. Great painting as usual! Another great unit John, they have a true 'campaign' look to them. You have developed a unique painting style.